Dr. Abha Mehndiratta is working as a Technical Adviserin India for the Global Health and Development Group, Imperial College London. 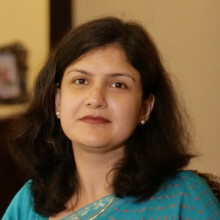 Dr. Mehndiratta is a pediatrician by training and completed her degree in public health at the Harvard School of Public Health as a Fulbright scholar. In India, she is engaged in the Global Health and Development Group’s work with the Department of Health Research, Ministry of Health & Family Welfare, National Health Systems Resource Center (NHSRC) and several State Governments and public health insurance schemes. This includes the provision of technical support for building capacity in critical appraisal of evidence and health technology assessment to inform decisions and the development of clinical pathways and quality standards to guide healthcare providers.